Sometimes I like to just make it up as I go in the kitchen. It can be fun to experiment and see what you come up with! I had some leftover pie crust after making a pot pie, and I had a variety of frozen, fresh, and dried fruit. I didn’t have enough of any one or even any two fruits to make a pie, but altogether I had just enough. So I went with the ‘kitchen sink’ way of cooking – throw in everything but the kitchen sink. I had frozen strawberries, frozen mixed berries (blueberries, raspberries, strawberries), frozen mango, a fresh apple, and dried apricots. I topped it off with some crumb topping and the result was surprisingly yummy! If one fruit makes a tasty pie, then six make an extra tasty pie. 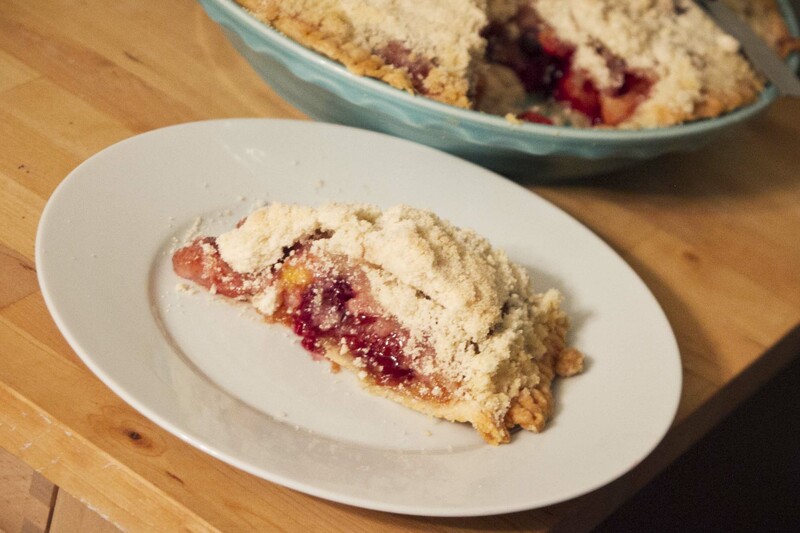 The flavors blended really well together, and I think I’ll be mixing fruits in pies more often! Prepare your dough and refrigerate for at least 1/2 an hour before using. Preheat the oven to 350°. If you’re using frozen fruit, defrost it. Chop the fruit and place it in a large bowl. Add the sugar, cornstarch, cinnamon, nutmeg, salt and lemon zest. Stir until all of the fruit is evenly coated. Prepare the crumb topping. Place the flour and sugar in a bowl. Cut in the butter using a pasty blender, fork, or even your hands. You could also use a stand mixer on a low setting until it’s reaches a crumbly texture. Don’t over mix or it will eventually turn into dough rather than crumb. If you made a full batch of pie dough, split it in half and roll out one half on a floured surface. It should be rolled to about 1/4 inch thickness. Pick up the dough using the rolling pin to support it and place it in the bottom of the pie dish. Trim excess dough and crimp the edges. 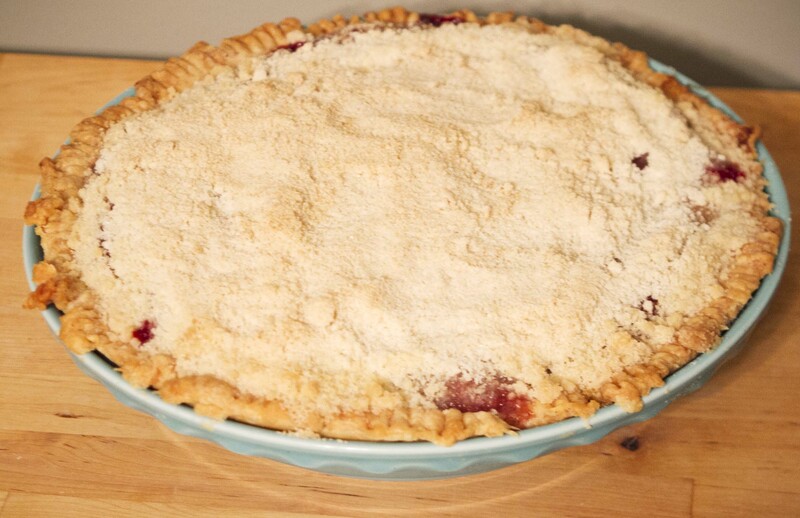 Pour your fruit mixture into the pie crust and spread it out evenly. Top the pie with the crumb topping. Or, if you’re putting a crust on top, roll out the crust, place it on top of the pie, trim the excess, and crimp the edges. You’ll also want to poke a few holes in the top crust with a fork so steam can vent out. Bake the pie at 350° for 45-60 minutes. The crumb should be starting to turn golden, and the fruit juices should be bubbling around the edges.